Monster Hunter: World launched its Appreciation Festival over the weekend, giving players a chance to replay once-limited time event quests and get a handful of colorful items for their armory. Its most exciting feature is a brand new fight against a massive, monster-eating Great Jagras. The fight is silly, difficult, and can result in fantastic rewards. If you’ve been playing Monster Hunter: World for any stretch of time, you’ve probably been around for one of its event festivals. Whether that’s the Spring Blossom Festival or the Summer Festival, Monster Hunter’s developers love having big, flashy celebrations. The Fan Appreciation Festival follows a familiar pattern. It offers some special armor to pick up with tickets earned for logging in, brings back the old roster of event quests, and adds a few new fights. This is a chance to hunt whatever monster you want and to pick up older armor sets like the surprisingly useful Devil May Cry Dante armor set or the once Japan-only Universal Studios set. If those quests are a little too familiar you can (and should!) check out the new battle with a roly-poly giant Jagras. The Great Jagras is the first major monster you hunt in the story mode. It’s a sort of floppy lizard that can puff up to great size. This version is even bigger, and if it manages to eat another monster, turns into an engorged, bile spewing monstrosity. All you need to do is sign up for the event quest “the Greatest Jagras” and head out on a hunt. You won’t be disappointed. We’ve had battles against big and even tiny jagras before, but this is an entirely new scale of creature. The result is a surprisingly tricky battle. 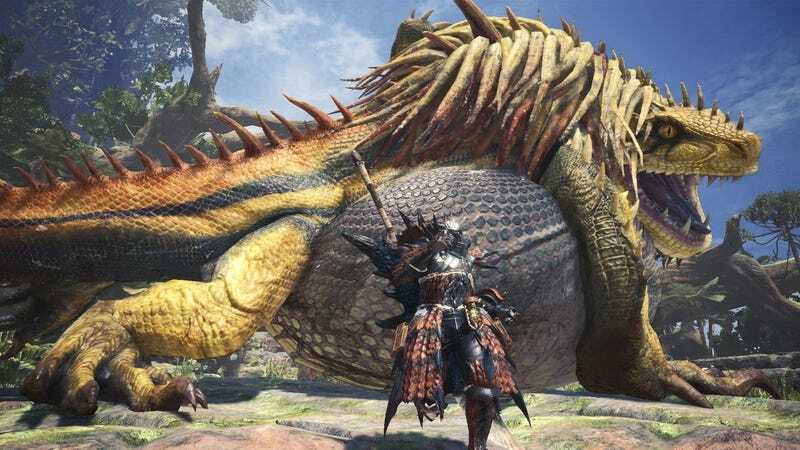 It’s set in the Ancient Forest and the Jagras’ large body makes it difficult to fight in tight corridors such as connecting areas between clearings or lower caves. After it gobbles up another creature, it grows larger and stronger. The first time I fought it I actually got knocked unconscious and had to retry. Why bother with a gimmick fight against World’s easiest monster? Throughout the battles, as the Jagras barfs or you damage it, parts will drop. Unlike normal monster parts, the Greatest Jagras drops decorations. These are the wonderful little gems that can be slotted into your armor to grant bonuses like extra attack power or elemental resistance. I’ve heard horror stories of players hunting specific monsters in an attempt to find a good gem. With luck on your side, you might just find it here. If not, you can sell the decorations for extra money. It’s not as profitable as selling the spare weapons from a Kulve Taroth fight, but the Greatest Jagras is nice and farmable with a group. That’s the point of a Fan Festival. To have fun and try new things, to face off against silly and dangerous foes with your friends. The Greatest Jagras is a perfect blast of hunting, packed with unpredictably fighting and good loot. While there’s more to come—including a quest with The Witcher 3’s Geralt of Rivia—this festival is off to a very fun start.